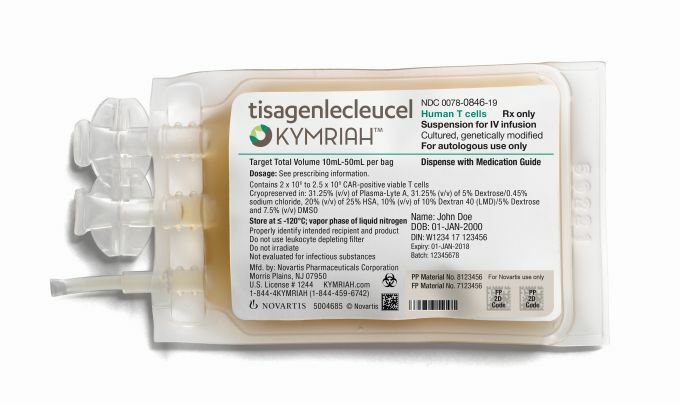 The FDA made history by approving the drug Kymriah, the first gene therapy to be made available in the U.S.
Kymriah, created and offered by Novartis, will be used to treat children and young adults with acute lymphoblastic leukemia (ALL), a disease of the bone marrow and blood, in which the body overproduces and accumulates cancerous white blood cells. In the U.S., about 6000 cases of this disease are reported every year. Every treatment with Kymriah is customized for the patient, using his or her own T cells—a type of white blood cell known as a lymphocyte. In this type of therapy, known as CAR-T, the patient’s T-cells are genetically modified to include a new gene that contains a specific protein (a chimeric antigen receptor or CAR) that directs the T-cells to target and kill leukemia cells. In trials, 83 percent of patients who received the treatment were cancer-free within three months–an amazing result. But there are some downsides to this new gene therapy treatment. A number of adverse side effects have been observed, the most serious of which is cytokine release syndrome, an inflammatory reaction to this type of treatment that can be fatal but is controllable with drugs. There is also the price: A single treatment with Kymriah will cost $475,000. Can Crowdsourcing Reinvent the Aviation Industry?